Half a decade, 2 years, four months and one week. It has been just over half a decade since I first moved to Leslieville. Then 2 years ago I left, to live in Korea. I moved back to Toronto and straight into Leslieville about four months ago. And it was just one short week ago I stepped into my new coffee haven, The Merchants of Green Coffee. I grew up in the west end of the city and moving from there, to the east end seemed like a bigger feat than relocating to Korea. But I did it, and haven’t looked back since. Even during my first stint of living in this part of the city it seemed like every week there was a new restaurant, café, gallery or store opening up. Leslieville was a work in progress. Now after my 2 year hiatus, it seems like a whole new place. For the first couple of weeks, all I wanted to do was wander around and re-familiarize myself with my old stomping ground. Enter Merchants of Green Coffee. How this little gem averted me for this long I do not know. For those who don’t know it, Merchants of Green Coffee is not on the beaten path of Queen Street East. It is a hop, skip, and jump away, but quite nicely tucked back. So if you don’t know it, you’d probably never stumble across it. Their address is 2 Matilda Street, nestled just east of the DVP, between Dundas and Queen. I promise you it’s worth the trip. Merchants of Green Coffee promote themselves as ‘specializing in the sourcing, importing and marketing of the highest certified quality green Arabica coffee. ’ Their mantra is Fresh Coffee, Fair Trade, Green Business. You had me at hello. The shop itself is big and comfortable with lots of space to lounge in. It feels more like a friend’s living room than a coffee shop, the perfect ambiance. There is a an old record player playing vinyl, comfy old couches and table seating, and a stack of board games if the mood strikes. The coffee they serve in house tastes great, and there is god stuff to purchase and bring home as well (for a while they were selling coffee plants!). They sell beans and great coffee accessories. Check out the PRESSO coffee maker. I picked it up and have loved every single cup it’s produced. The staff is also extremely laid back and friendly. 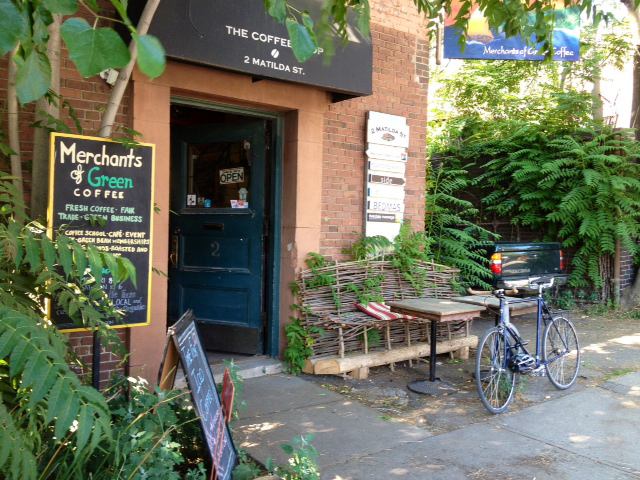 So if you’re looking to go for a little wander in a familiar neighbourhood, veer off the beaten track and make a break for Merchants of Green Coffee, I promise it won’t disappoint.